See reviews by industry professionals and technology experts, or read below for testimonials from health researchers and customers. 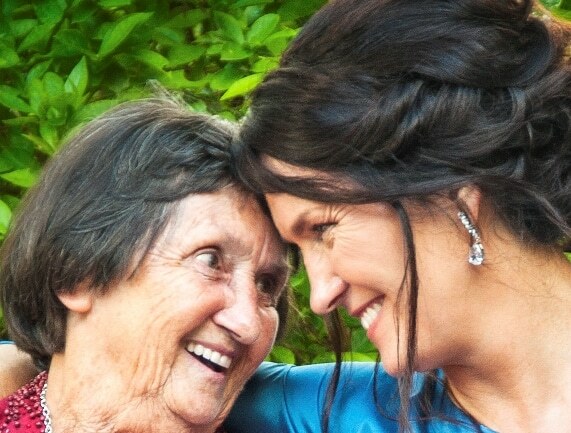 My 84 year old mother has Alzheimer’s disease. Mum lives independently in an over 55’s retirement village interstate. She wears an Emergency Assist button “just in case”. In September I visited Mum and found her ill with an acute bowel problem. Mum hadn’t told anyone she was unwell, or that she hadn’t eaten or drunk fluids for several days. This illness really hit home how fragile Mum was becoming. I was due to travel overseas a few weeks later so I implemented some measures to assist Mum. One measure was a video phone from Konnekt which would allow me to use Skype with her and was also simple for Mum to use. I wanted to be able to see Mum when I was away as she had become very labile in her ability to inform family, friends and her GP when she had pain, or was feeling unwell. When I left Australia, Mum was feeling okay. Three weeks later we spoke on the video phone and she said her abdominal pains had returned. Thankfully she had taken herself to see her GP that afternoon. Unfortunately, the x-ray procedure he ordered was not available for a week or so later and Mum was not able to inform him as he had gone home for the weekend. Subsequent Skype sessions over the weekend enabled me to visually check on Mum’s condition: she appeared stable. I decided to call her via Skype early Monday morning Australian time to find out her exact x-ray appointment date so that I could ask her GP to push for it to be performed earlier. I have Mum’s video phone configured so if she doesn’t answer it opens up anyway, allowing me to see what is happening. On this occasion Mum didn’t answer and the video phone went to automatic opening just as she was coming into view. I could see she looked very unwell and was in obvious need of an ambulance. To cut a long story short, the video phone allowed me use my nursing skills to assess my Mum and determine that her bowel was possibly obstructed and that she was dehydrated. Due to her age and heart problems Mum was heading towards a potentially catastrophic event i.e. a cardiac arrest. The video phone allowed me to observe my Mum and comfort her whilst waiting for the paramedics to arrive. It also allowed me to tell the paramedics what had happened as they assessed her before taking her to the Emergency Department. Mum was diagnosed with a bowel obstruction and was operated on that day. If it was not for the Konnekt video phone assisting me to visualize my Mum, I am pretty certain my Mum would have died a very horrible death in her unit within 24-48 hours as her recent behaviour suggests she would not have told anyone how she felt. For older adults the probability of developing symptoms of depression steadily increases as the frequency of in-person social contact decreases. Our research showed that such an effect did not exist for phone, written, or email contact. What does this mean? Social isolation is bad for your mental health, and regular face-to-face social interactions are likely a great way to help prevent depression. It’s been great being able to talk face to face with Mum and Dad – particularly when they have been ill, or I haven’t been able to be there as much. It seems so much more personal seeing their faces. Konnekt has been very helpful in bridging the time between personal visits to mum. She loves to see the faces of me and other loved ones who are great distances away. Mum is usually super uncomfortable around any kind of technology but Konnekt’s extreme simplicity has made it so easy, approachable and even fun for mum to navigate. I can’t recommend it highly enough. I love seeing my son in Queensland, and keeping in touch with family and friends is so much easier than my other phone. The large buttons on the touch screen remind me that I have many family members and friends around Australia that I can call. Being able to see Dad bridges the gap of living so far away. Konnekt Videophone makes it possible to relax and stay in touch when I am working anywhere around the world. Individuals with hearing loss can use sign language or visual cards to communicate over the videophones, both with staff and with other people in their network such as parents, friends and neighbours. The Community Living Society (CLS) supports individuals with developmental disabilities or acquired brain injuries to live meaningful lives as full citizens. CLS manages multiple units and apartment blocks in Canada that house residents who live independently. Some residents also have other disabilities such as a mobility impairment, a hearing or speech impairment, or total deafness. Residents were using an ancient pager system to request assistance from overnight support staff. The system only communicated who called. There was no effective way to assess the need quickly, prioritize when there were multiple callers, or avoid unnecessary visits. Konnekt Videophones replaced the system, enabling a 2-way video connection between staff and supported individuals. Those with poor mobility can also make or answer calls using access switches. For those with a hearing disability, Videophone turns on lamps in other rooms when there’s an incoming call. Now, the supported individuals can immediately see and talk to their overnight staff, they can communicate their need, and sometimes resolve the issue without a home visit. Supported individuals also hear from staff that they’re on their way or, if staff are busy with another task, that they’ll be on their way as soon as they can. Unlike the old pager system, staff can see that all the devices are online without needing to enter the supported individuals’ rooms. The best thing is that when someone calls, the staff can immediately see whether assistance is required and are able to prioritize care. The videophones enable Chris and his friends to chat easily between their apartments and help each other using their individual abilities and skills, while they learn to be more independent. Chris is a young man who recently moved out on his own for the first time. In his Community Living Society (CLS) apartment in Vancouver, Chris uses a Videophone to stay connected to his family and to talk with friends who are moving with him into neighboring apartments. The group shares the same excitement and worries, and are a great support to each other. The videophones, with their easy connection, enable these friends to chat easily between their apartments and help each other using their individual abilities and skills, while they learn to be more independent. 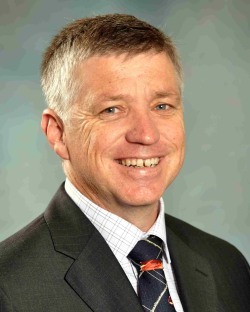 With his videophone, Chris can call Mum to ask how to make his favorite breakfast, or call his staff to ask what to do about a leaking pipe in the bathroom before it turns into an emergency. At night he has a button in bed that connects him to his Mum who lives a few blocks away. They can see and hear each other and, if Mum is unavailable, videophone can automatically call Chris’s support staff for assistance. Thank you so very much for your wonderful service and help in regards to Mum’s Videophone. Your communication, interactions and follow-up have made the process so easy. It was very touching watching and listening to my Mum’s and my Aunt’s reactions and conversation today. Because of their health issues they have not seen each other for a few years. The distance in kilometres for them makes it difficult for travel. To see them touching their hands on the screen and blowing kisses to each other was priceless. You have a fantastic product! I have seen an enormous difference in my Grandma since having a Videophone installed in her room at her aged care facility. She seems so much happier and more settled than I have seen her in a long time. I truly can see the impact that having that instant connection to her loved ones has made all the difference for her. The face to face contact that video calls provide is just so important for someone in her position. To see that smile on her face when we talk is fantastic. Thank you Konnekt. Your customer service has been outstanding. Thank you for your meticulous attention to detail. When I recently saw an advertisement in the November 2016 issue of RACV Royal Auto for Konnekt I made contact and after an informative and friendly introduction by Natalie then got to meet the directors John and Karl. 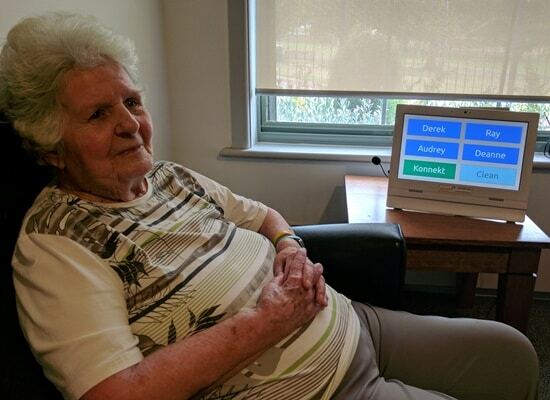 Following discussions around getting my 90 year old mother June who is a resident at Uniting AgeWell Box Hill in touch with family and friends, we arranged the installation of a Konnekt Videophone in December 2016. Konnekt did a wonderful job of managing the installation. They overcame some initial hurdles using their skills and communicating with UAW IT department. This ensured the smooth set up without my involvement. June has been resident for 4 years and unable to make outgoing calls for over 3 years as she cannot press the buttons on her phone. 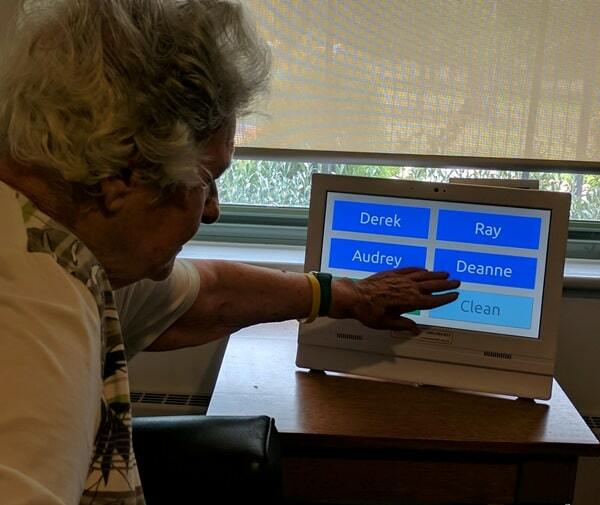 Now June just touches a 15 inch Videophone screen on the name of the person with whom she wishes to speak. This now puts her in control to communicate on a Face to Face meeting via simple and easy to use technology. June now calls me most days and her overall wellbeing has improved out of sight in the past 3 months, as she can readily communicate with friends and family when she chooses. June has always been a fiercely independent person and this has given her back that independence. 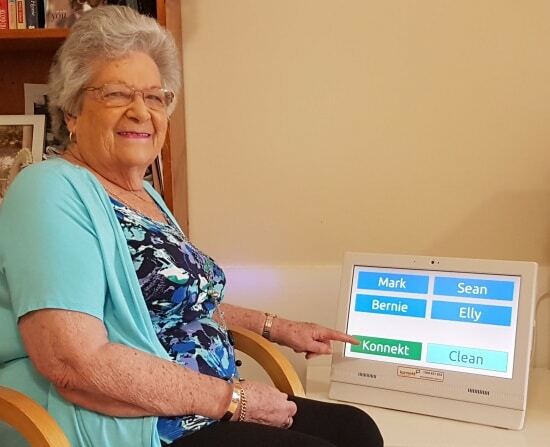 This fantastic use of technology has given June the ability to regain her control over communication and not feel isolated or lonely. June has become a pioneer amongst her 120 strong community and we have introduced Konnekt to UAW to bring this technology within the reach of the rest of her community. Thanks to the team at Konnekt for giving June her independence. It is wonderful to be able to see each other despite living interstate. It is almost like being in the same room and the time on the calls brightens both of our days. I never thought that my father would be able to use a video call system but having the separate easy to use unit with big buttons means he can call me and other family members easily. Your product has changed the life of my mum in Germany, who can now see her grandchildren in Australia and around the world. I would like to take this opportunity to thank all the wonderful Konnekt staff for the immense help you guys have given to help us set this up for my grandma. She feels more connected being able to see us, especially the great-grandkids, whenever we call. Konnekt has been a great way for our brother to stay in touch with the family. He has really enjoyed it and quickly mastered the simple to use setup despite his disabilities and lack of computer experience. The support to get started was a great help. 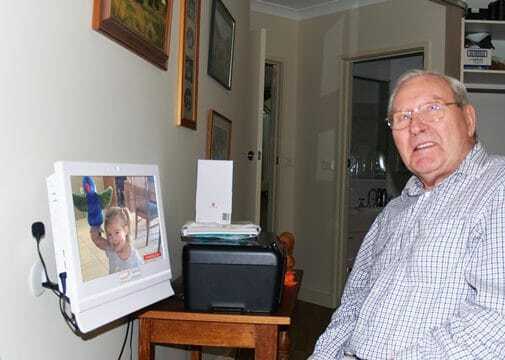 Konnekt Videophone maintains the connection between my children, myself and my parents- the distance now between Europe and Aus has been minimised. So easy that with the press of a button my parents are in our living room!!!! Fabulous! 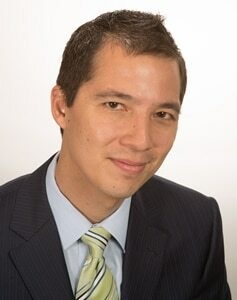 Your assistance has been invaluable; speedy, clear and simple instructions, professional. QUALITY! I saw Konnekt in a seniors magazine. It works well for my mother who is infirm and has mild Alzheimer’s. She calls a son in Vietnam, myself in Queensland, my sister in Perth and various grandkids. It works really well. I talk to Mum nearly every day now. Sometimes while watching TV on iPad, I say Hi during an ad. Good to catch up with you in Perth and again I must say I am very pleased with the care you and your staff are providing to my Mum June. Thank you. I am sending you the link to the videophone website. As mentioned, I am very happy with it and I now call Mum almost daily, as do other family members. It auto answers and you can have names in very big letters for them to press. There is a buy or rent option. I have been using it now for four months and it has worked very well. As you know my Mum, June would not be able to use a mobile phone or iPad. I use a dedicated Optus modem, but it would work well with existing Wi-Fi. You are welcome to use Mum’s to further test. Dr Adeoye was also very interested in it and I mentioned I would be sending the details to you to pass on to him. Happy to say all running smooth and using the Videophone regularly. Came in handy when I had to explain to my 16 yo son how to set up Nan’s new oxygen machine and nebuliser .. so much easier with visual and audio than if I had to do it over phone. Thanks so much, it has brought me peace of mind and I actually call Nan more frequently as it’s easier for her to talk and relax in her lounge and have a conversation.